The Decorating Hatpins Tutorial will show you how to get this customised look for yourself. It is one of the cheapest and prettiest ways to make your cards special. 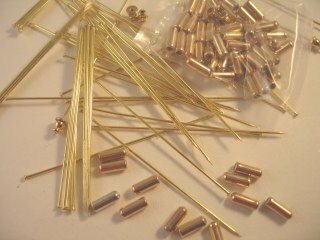 The subject of this low cost item was discussed in Decorative Pins, and there we covered some of the simplest ideas. But as you get better, and enjoy adding these to your designs. I thought that the easiest way to show you some stunning results would be to make a short video. These are just a few of the ones I have made over the last few days and once you start making them it becomes addictive as they are such a pleasure to do. And of course all your creativity comes to the surface and you will surprise your self at the ones you come up with. Let the Decorating Hatpins Tutorial show you how. Beads are not expensive to buy and you will get quite a lot for your money. Buy them in different sizes and colours, as well as finishes. 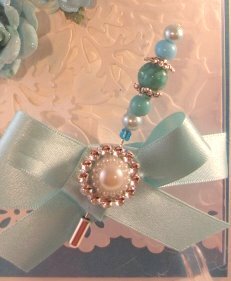 The collection I have are pearls and glass beads as well as some gold and silver spacer beads. And the bit that covers the bead is the bead cap and they can just add the finishing touch. And you could always dismantle any necklaces that you own that you no longer wear. The first thing you are going to need are the Hatpins themselves. They come in many different sizes and some will already have beads attached, as you will see in the video. But I like to buy mine plain in gold and silver and assemble them my self. There you will find a good assortment of sizes and styles in pins for all your needs, as well as beads in glass, fimo, metal and lampwork to make the most adorable pins for your cards. Their sevice is quick and polite and they will help with any queries you may have. 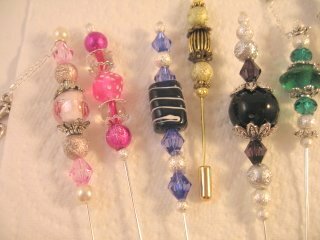 Experiment with colours and styles as I have done in this Decorating Hatpins Tutorial. And if you do a dry run with the beads first then nothing is lost if you don't like the arrangement. Just undo it and start again until you are happy and then....and only then glue them in place. 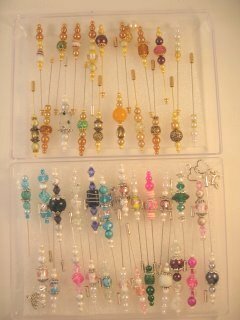 You will find many sizes in the hatpins but the one that is my preference is the 3". This will give you a lovely pin that won't overpower the card as the effect you want is classy. The pin I added to the card in the video was too large and so I changed it for this one that gives a more elegant look to my finished design. I was very pleased with the result and I am sure that you will be too, with the ones you create for yourself. 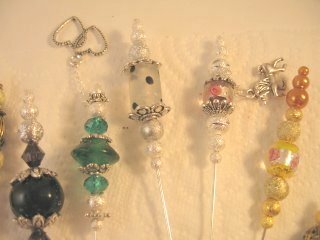 I hope you enjoy the Decorating Hatpins Tutorial and will add some of your finished cards to the Gallery Page. Try to include a close up of the pin in one of the photos that you add.